Have you heard of Ray Edwards Jr.? Defensive player for the Atlanta Falcons? Yea that one! We just launched his new website – www.rayedwardsjr.com. This site was designed to build Ray’s name and educate people about his passions outside of Football, including non-profit work and boxing. The design of the site has a subtle background of the Atlanta skyline, an ode to his home team. In addition to custom design and development, o2 Group created a logo to represent Ray Edwards. 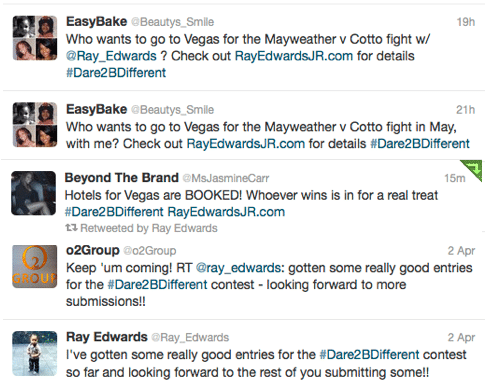 With the launch of the site was the launch of a contest to win a weekend trip to Las Vegas to spend time with Ray Edwards and go to the Mayweather vs. Cotto fight! The contest integrated social media (twitter, facebook, youtube) with the website to drive people to submit videos and essays for why they should win the trip. All of this was tagged with Ray’s motto, #Dare2BDifferent.